How to get rid of that? The workaround is to hide the item with some CSS code. The name for the property is "applicationCSS" and in the value field link to your CSS file. 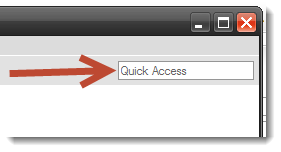 The quick access should be gone next time you run your application with the product configuration.